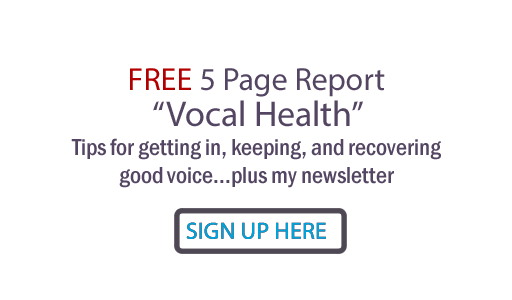 Judy Rodman - All Things Vocal Blog: Stomach bug and have to sing? Oh my, there's nothing like the stomach bug to destroy your breath support/control for singing. Hard to be stuck on the 'throne', not to mention it's really disconcerting to have to throw up all over your bandmates/ audience! Checked in with bandmates who connected her to her employer who called in a hotel doc. Got some prescription meds (never take a prescription drug without asking your doc- it could kill you and it's hard to sing dead) phenergan worked for her. Finally got some liquid down (soup worked for her). Skipped sound check and slept. Made the gig. Didn't dance a lot. Oh well, it could have been laryngitis. This ever happen to you? "Made the gig. Didn't dance a lot." Ha! I can't believe she went on, being that sick. Bravo for her! Your pal needed some help from CHIROMAN. I had two patients yesterday with bad bugs; one had pneumonia, the other had the flu. I put them both in front of the Beam Ray for 25 minutes, and knocked the stuff out over 80% better within hours. Not bad. A couple of good adjustments can ramp the resistance way up as well. Glad the show went on. Keep up the good work. Leigh Ann.. I KNOW that YOU KNOW the show must go on:)hehe- yep, this is a true test of that old adage! Dr. Allison, you being my chiroman I know that if I had such a malady (may it never happen to me!) I would definitely be getting myself in for your treatment! Thx for the heads up! Judy, the answer to that one is unfortunately, yes. A few things that help me when I am really in trouble is a plain piece of bread or an unbuttered piece of toast...sipping on cool (not cold) Coke Cola helps sometimes, too. I guess my best piece of advice is to eat or drink just what you absolutely need and no more before a concert, whether I am feeling good or not. PJ... yes, I've done that, too, and also ginger ale. I didn't mention this, but I also gave her my little bottle of ALC (Advantage Liquid Concentrate) It has grapefruit seed extract, jasmine tea, green tea.